The latest images from NASA’s Juno mission may help scientists better understand the fate of the giant oval storm. This week, NASA’s Juno spacecraft swung low over Jupiter’s Great Red Spot and got its best look yet at one of the most iconic storms in the solar system. From just 5,600 miles above the crimson coil, the spacecraft saw a turbulent tangle of clouds punctuated by smaller, swirling vortices. Jupiter’s roiling, reddish splotch is a tempest of truly Shakespearean proportions. It’s so large you could comfortably tuck Earth into its lidless eye. It’s one of the features that people can easily pick out when staring at Jupiter through a backyard telescope. And its thunderstorms have rumbled nonstop for centuries, searing the air above the planet’s colorful cloud bands at temperatures hotter than lava. On other planets, storms of this size tend to come and go rather quickly; Neptune’s Great Dark Spot, seen by the Voyager 2 spacecraft in 1989, had vanished by 1994. On Saturn, a whitish storm erupted in late 2010, grew a tail that circled the entire planet, and then bled into nothingness over the next year. NASA's Juno spacecraft entered Jupiter's orbit on July 4, 2016. Find out more about this historic mission to our solar system's largest planet. It’s tempting to imagine that this Jovian tempest will decorate the face of our biggest planet throughout its lifetime. But over the last 150 years or so, the Great Red Spot has been shrinking. Estimated to measure more than 25,000 miles across in the 1800s, the storm has contracted into a rounder, more orange blotch spanning just 10,140 miles across as of this April. Some observations even suggest that the spot is shrinking faster now than ever before. Using the Hubble Space Telescope, Simon has kept an eye on the storm for years; she also has data going back to the 1870s suggesting the storm was noticeably contracting even then. 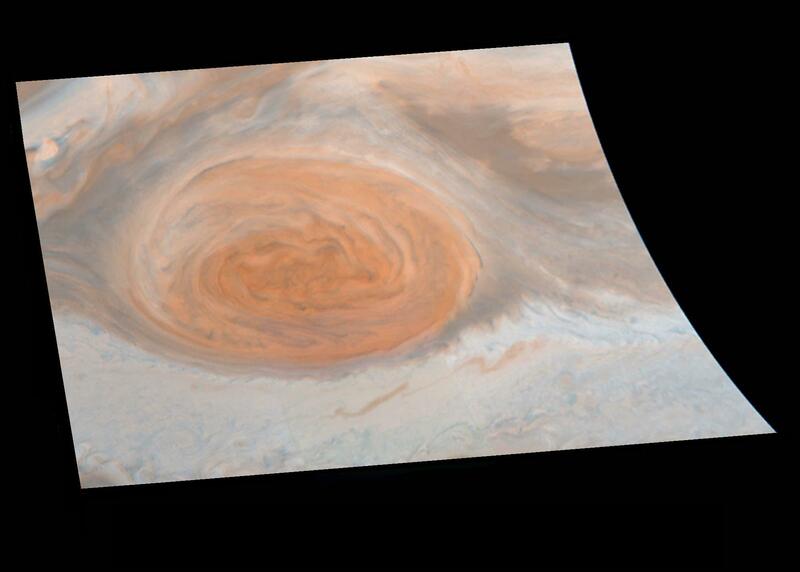 Simon says it’s normal for storms to become rounder as they age, and that she can’t predict yet whether the Great Red Spot will shrink into nothingness or assume a more permanent, circular form. Images like those from Juno should help her and other scientists to better understand the internal dynamics that are both feeding the storm and potentially draining its energy.